In appearance, mushrooms are drab and sometimes gnarled, even eerie; nothing like the colorful, juicy fruits and vegetables we associate with healthfulness. In taste they are often mild, absorbing other flavors and adding a velvet woodiness to foods, but rarely dominating. Yet of all Earth’s natural substances, mushrooms are among the most medicinal—and incorporating them into your diet is simpler than you think. While researchers are only beginning to understand how the many compounds in mushrooms may fight ailments ranging from infections to cancer, two substances have begun to stand out above the rest. First are the terpenoids, potent antiviral, antibiotic and anti-inflammatory agents. The others are complex chain-like sugars called polysaccharides, which enhance the immune system and help the body fight cancerous tumors. The polysaccharides in mushrooms responsible for revving up the immune system are known as beta-glucans. Also found in oats and certain yeasts, the polysaccharides in mushrooms responsible for revving up the immune system are known as beta-glucans. Because beta-glucan’s chemical structure resembles that of bacteria, eating it alerts the body to beef up its defenses. Thinking an invader has entered, the immune system boosts the production and activity levels of various infection-fighting white blood cells. The following three medicinal mushrooms have studies backing their safety and efficacy. They lend a powerful boost to your diet, but be sure to consult your health practitioner before using mushrooms to treat a health concern. Maitake (Grifola frondosa) Also known as “hen of the woods,” maitake mushrooms have been shown to help lower blood pressure and reduce blood sugar levels. Maitake can be used fresh or dried in supplements, tea or soups. 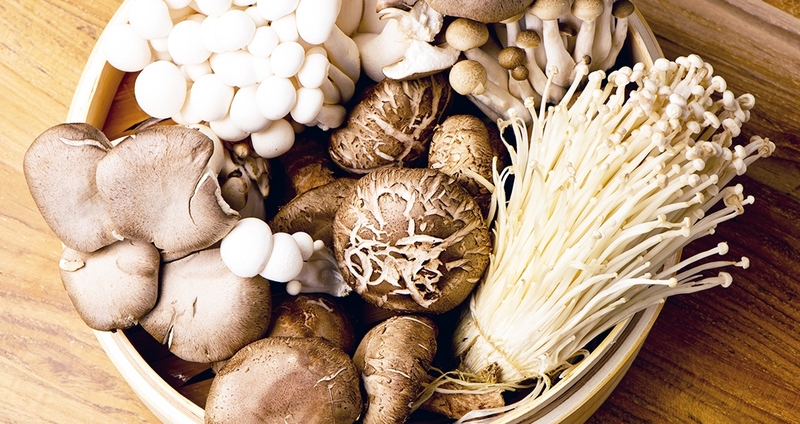 Shiitake (Lentinus edodes) The shiitake is common on restaurant menus, but studies have shown it can also boost immune function and help battle overgrowth of the yeast Candida albicans. Try using dried shiitake to make tea or soup. Reishi (Ganoderma lucidum) The reishi mushroom has long been known as an “elixir of immortality” in Taoist tradition. More recently it has been valued for producing antiviral effects in the body, as well as helping to fight coronary heart disease, asthma, hypertension and arthritis. Of the six types of reishi mushroom, red reishi is most frequently used medicinally. You can find reishi in liquid extract or powdered tablets. FUNGI FOOD: Organic shiitake and maitake mushrooms can be found fresh in many natural foods stores and make nutritious and delicious additions to soups, stir-fries and stews. To use, wipe off any dirt, trim the stems, and include in your recipe. Be sure to retain any cooking water, as it will be rich in beta-glucans and other nutrients. Although reishi mushrooms are too tough to eat, boiling them in water for an hour will produce a strong, nutrient-rich tea, or stock for soups and other dishes. To mask any bitterness, try adding one part fresh ginger to eight parts reishi mushroom.